One of the most discussed issues regarding the Illyrians of classical antiquity has to do with the presence of a major city with rich silver mines in the Balkan hinterland. This city minted its own silver coins and was controlled for a long time by the major Illyrian tribe of the Dardanians. It even turned into the capital of Dardania for some time. This city was called Damastion and its location, being of cultural and economic importance, remains unknown to this day. For the first time Damastion is mentioned by the ancient historian and geographer Strabo who states that the silver mines of the city were located near the lands of the Illyrian tribes of the Taulantii, Parthini, Brygi and Bylliones. Thus, the geographical location of these tribes may help in pinpointing the potential area where Damastion stood. In addition, the Taulantii inhabited the area around Dyrrachium/Epidamnos (Durrës) in current central Albania. 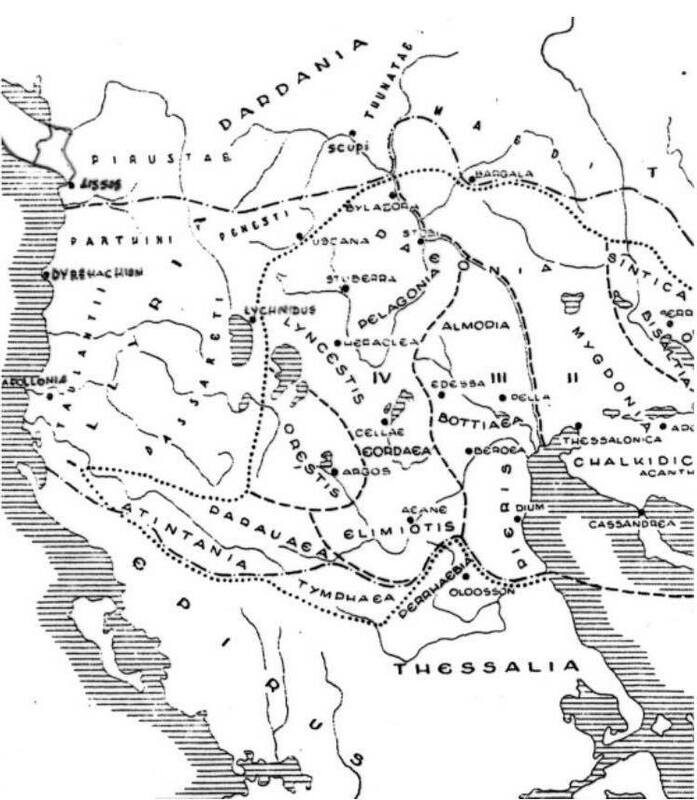 The Parthini, who may have represented a tribal branch of the Taulantii, were located north of the later, in the hinterland between Dyrrachium and Lissus (Lezhë). The Brygi, who seem to have been a small tribe, may have been located horizontally somewhere in the lands between Dyrrachium and Lychnidos (Ohrid). The Bylliones were the Illyrians who inhabited the city of Byllis (Hekal,Albania) and its surrounding region. They, as the Parthini, were part for a long time of the Illyrian kingdom of the Taulantii. Thus, if we refer to the description of Strabo, then the silver mines of Damastion and the city itself were located near the lands of the tribes mentioned above. Strabo adds that the tribes of the Dyestae and the Enchelii (Encheleae) ruled over Damastion. Here he may be referring to a possible rule of king Bardylis of the Encheleae (an Illyrian tribe) over Damastion. A possible rule of Damastion by Bardylis may have helped substantially the financial prosperity of his kingdom. The other mentioned tribes of the Dyestae may have been of Thracian origin. In such a case, Strabo may have implied a common Illyrian-Thracian rule over the city and its silver mines. Position of the ancient tribes and regions including the ones mentioned in the article (from Papazoglu 1988b as illustrated by Morgan 2009). Many scholars have given their assumption regarding the possible location of Damastion. Their proposals include Epirus, the hinterlands of Dyrrachium and Apollonia, and even regions as far north as Dalmatia (current Croatia). Various proposals include Dassaretis, the region south of lake Lychnidos (lake Ohrid). However, the issue with this area stands in the fact that the geological structure of its lands makes the presence of the silver mines here impossible. In addition, Strabo mentiones other places in relation to Damastion, notably the Eoerdi, Elimeia, and Eratyra. The first two were part of the region of Lyncestis while the position of Eratyra remains unknown. Thus, it is reasonable that the regions corresponding with the ancient Lyncestis be taken into consideration as possible locations of ancient Damastion. Among the proposals, Paeonia represents an interesting option. Paeonian kings are well known for having produced various coins with the inscription “Damastion” (“ΔΑΜΑΣΤΙΝΩΝ”) in them. The Paeonian option seems more plausible when we consider the existence of several silver mines in the area between Scupi (Skopje) and Pautalia (Kyustendil). The main problem with this area is that it is located further east from the Illyrian tribal lands mentioned by Strabo. Alternative proposals include current southern region of Albania; current regions of Mati and Dukagjini in northern Albania, and Pelagonia in FYR Macedonia. Another option proposed by Mirdita states that Damastion might have been located near the current village of Kishnica in Kosova, between modern Janjeva/Janjevo and Prishtina/Pristina. This area is also known as a mining region where antique mines have been reported. Thus it makes Kishnica an option worth considering. Further northwest, another potential location is found. It refers to the rich in minerals area of Kopaonik mountain range (south of modern Serbia). The mountainous region of Kopaonik was known by the Roman references as Municipium Dardanicum and served as a mining center in the Roman imperial period. The only issue with this area, as with Paeonia, is that it is located somewhat far from the suggested lands of Strabo. Based on another fragment of Strabo, provided by a document stored and recently discovered in the Vatican, Damastion may have been established initially as a Hellenic colony. According to the fragment, the colons came from Aegina and Mandra after Athens forced them out of their lands in 420 B.C.E. If this is the case, then this represents a unique case in the history of Hellenic (Greek) colonization since such colonies were usually established along the coastlines whereas Damastion appears to have been established deep into the hinterland. The city may have taken the name of the leader of the colons, “Damastes” or “Damastos” (from an attested ancient Greek personal name), followed by the ancient Greek particle “on”. In such a case, the Hellenic colons must have had problems retaining the control of the city since it lacked the access on sea routes and hence the crucial communication with other Hellenic trade centers. Thus, even in such case, Damastion soon fell in the hands of the native Dardanians. It is assumed that Damastion started to emit its first silver coins around 395 B.C.E. After some time it apparently fell under the rule of the powerful Illyrian monarch Bardylis I (r. 393-358). The control over Damastion may have helped Bardylis expand his commerce with other populations of the north and other tribes around his state. Furthermore, under the model of Damastion, Bardylis established in 365 B.C.E. another center for coin emission in Daparri of current Kosova. The mentioning of a common Illyrian-Thracian rule over Damastion suggests that the city should be searched in an area located in between the Illyrian tribes and the Thracian tribes. As such, Dardania, inhabited by the Illyrian tribe of the Dardanians, in modern Kosova, represents the area that best suits this description. It should be noted that the Dardanians expanded their control way east, all the way into the borderlands of the Thracian tribe of the Triballi. This Dardanian expansion occurred after Alexander the Great defeated the Thracian Triballi. As a result of this situation, the search for Damastion and its silver ores is narrowed down into the area that was once controlled by the Dardanians. In order to determine a more precise location of Damastion, we can observe the places where coins emitted from this city have been discovered. However, it is at first useful to make a summary of the types of coins that Damastion emitted. Its coins are divided into three types: the tetradrachmas, the drachmas, and the tetrobols. The coins with the most value, the tetradrachmas, have the figure of Apollo featured on them while the two other types of smaller values, the drachmas and the tetrobols, manifest figures illustrating the activities of the people and the mine. The drachmes also feature a female head while in the tetrobols reapers the figure of Apollo. There are more than 40 coins of Damastion discovered in various places across the southwest Balkans including countries such as Greece, Albania, Montenegro, Kosova, Serbia, and Croatia. However, it has been noted that most of the smaller denominators of drachmas and tetroboles are found in the area that consists with current region of southern Kosova. This is of special interest when considering that smaller denominations are usually concentrated around the mines from which they have been emitted. Also, the geological structure of this area allows for the presence of an ancient silver mine. Based on the same view, the area around modern Skopje should also be evaluated as a region where in antiquity the Illyrian kingdoms of Dardania and Paeonia bordered. The ancient literature available also tends to put Damastion in the current region of southern Kosova and/or Skopje. These sources mention Damastion as the capital of Dardania while also allowing other interpreters to assume that Paeonia controlled Damastion in certain periods. The pattern of find spots of coins produced by Damastion. Larger dots represents coin hoard discoveries whereas smaller dots represent single coin finds. 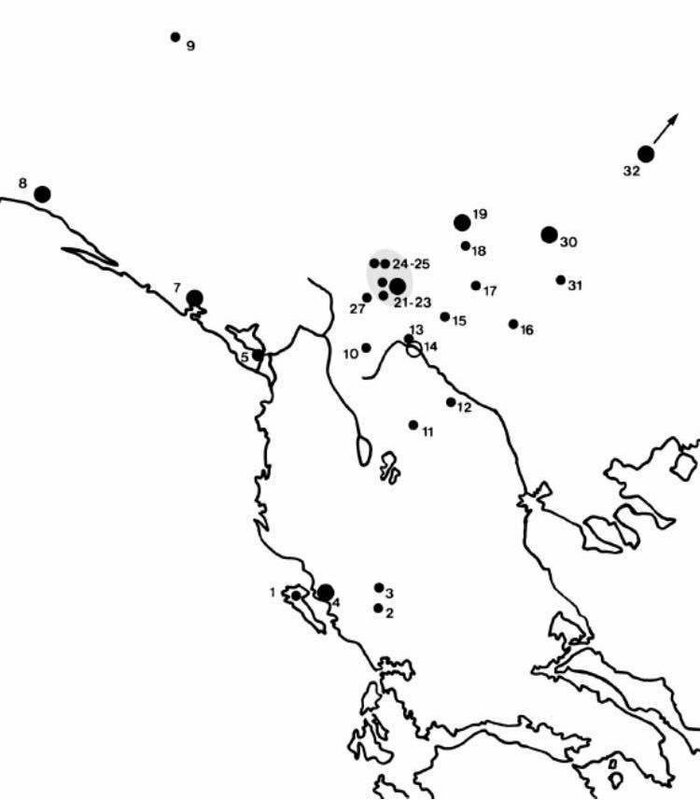 The grey area illustrates a concentration of finds, especially of smaller denominators (drachmas and tetrobols) in current south of Kosova. As such the grey area represents the most adequate location for ancient Damastion according to this pattern. One recent proposal suggests that Damastion is located in the current village of Popovë, west of Podujeva/Podujevo, in Kosova. In this locality, the traces of an ancient city with its surrounding walls can be noticed along with the remnants of a castle and traces of melted metals. Towards the castle, that is distanced about 1,500-2,000 meters from the surrounding walls, an ancient road 2.5 meters wide made up of stones is directed. Furthermore, this site is located near the rich mines of Kopaonik Mountain (also known as the “Silver Mountain”). The nearby river of Kaqandoll must have served for washing the metals and the coins. Thus, the ancient city of Damastion may have well been located in this city that fulfills all the criteria presented by ancient writers and modern scholars. Pollozhani, M.(2015). Qytetet e harruara Ilire, lashtësi e pandriçuar. Retrieved from: www.arbresh.info/kulture/qytetet-e-harruara-ilire-lashtesi-e-pandricuar/. Morgan, D.U.(2009). The pattern of Findspots of Coins of Damastion: A Clue to Its Location.